Turnips are a great addition to your late season vegetable garden. Growing turnips is easy, and these tasty root vegetables are among the most reliable cool-weather crops. Like cabbage, exposure to chilly fall temperatures make turnip greens sweeter and enhance the texture of the vegetable’s roots. Harvested turnips can be stored for months in a cool, dry place to be enjoyed all winter long. To harvest in spring, sow seeds directly in the garden or prepared planter as soon as the soil is workable (not too wet nor frozen), usually 2 to 3 weeks before the average frost date in your planting zone. However, the ideal time to plant turnips is late summer/early autumn which will produce a bountiful fall crop and more flavorful harvest. 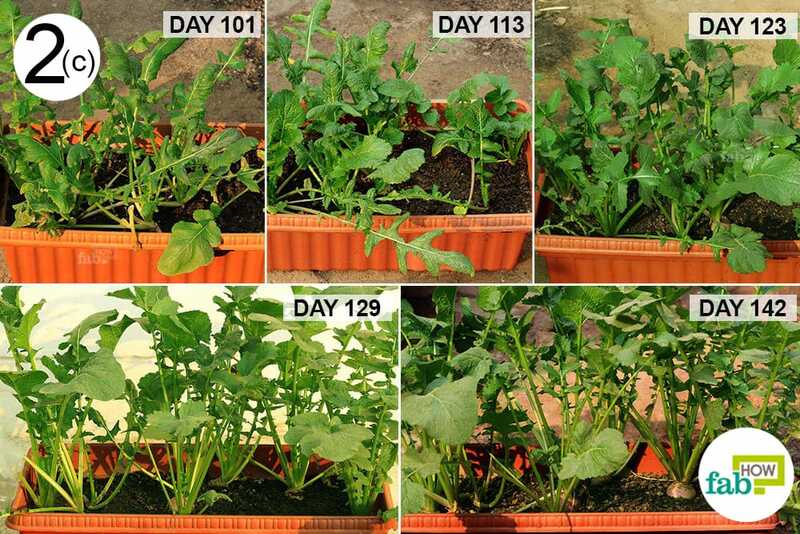 Achieving strong and healthy turnips depends on providing suitable growing conditions to promote vigorous growth. Although turnips are relatively carefree, consistent soil moisture is essential. Watering at the rate of 1 inch per week to prevent the roots from drying out is crucial to preserve flavor. Peas are a suitable companion plant for turnips and can provide extra nitrogen in the soil to feed the turnip root and enhance growth. Turnip roots are generally ready to harvest after 6-10 weeks. Try them roasted, added to soup, or as a delicious substitute for potatoes. The ‘Golden Ball’ or ‘Orange Jelly’ variety has been a mainstay of European turnips for over 150 years. It has a finer flavor than many of the white-fleshed varieties as the lovely yellow flesh is sweeter and milder. ‘Yellow Globe’ has wonderful golden turnip roots, great for roasting. ‘Purple Top White Globe’ is great for an extended production of greens. Considered an heirloom (pre-1880), it’s productive and easy to grow, producing large purple-white roots. ‘Tokinashi’ white turnip is a traditional cultural vegetable of Japan. It has an incredibly sweet taste and rich flavor. The roots are nice and smooth with crisp, white flesh of excellent quality. Boosts Immune Function: Turnips are an excellent source of vitamin C. Just one cooked cup supplies 30 percent of your daily requirement. Fights Cancer: Turnips (along with broccoli, kale, cabbage, and cauliflower) are considered cruciferous vegetables, rich in cancer-fighting compounds such as glucosinolates and indole-3-carbinol. Aids in Digestion and Constipation: With 3.1 grams of fiber per cup, adding turnips to your diet can aid in digestion and regularity. As it moves through the digestive tract, the fibrous turnip adds bulk to the stool, treating constipation naturally. Combined with other fiber-rich foods such as berries, figs, and avocados, turnips can effectively increase stool frequency in people suffering from constipation. 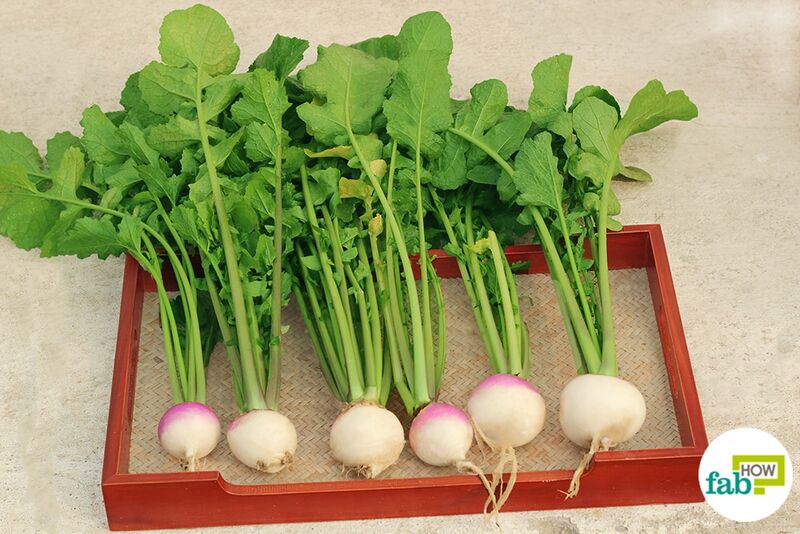 Turnips grow best in well-drained, fertile soil with a pH between 6.0 and 7.0. 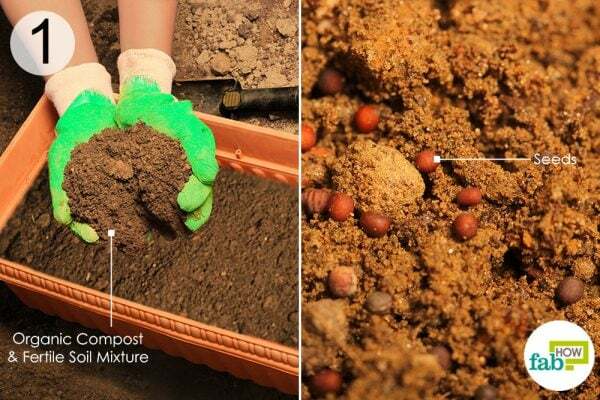 Loosen your garden soil to at least 12 inches deep while mixing in a half-inch layer of organic compost to enrich the bed. Rake in a light application of balanced organic fertilizer to ensure there are ample nutrients in the soil. Soil preparation is key to successful crop production and plant vitality. Select a planter with a few small holes in the bottom. Ensure that it is deep enough to accommodate root development with ease. The size of the planter depends on the number of seeds you intend to plant. Line the holes in the bottom with a coffee filter to facilitate drainage in the soil. Fill the planter with the prepared soil. Don’t compact the soil with your hands, as the turnip roots require a well-aerated soil. In appearance, turnip seeds somewhat resemble mustard seeds. Purchase the seeds of your desired variety from your local seed store or garden nursery. 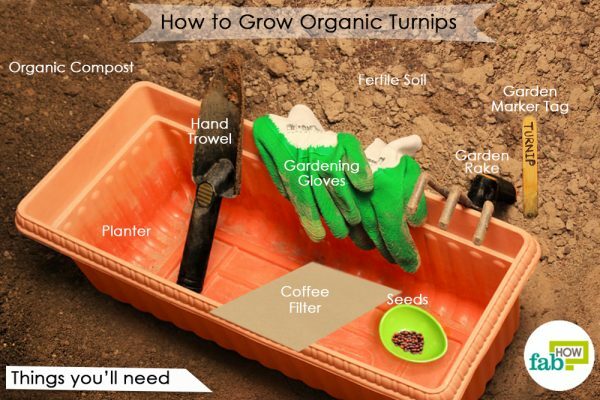 Sow turnip seeds about 2 inches apart and half an inch deep. Plant your seeds in rows that are six inches apart. Depending on weather conditions, germination usually takes place within a few short days. 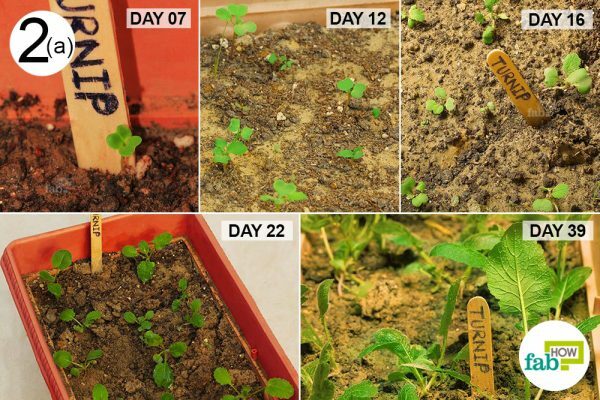 Germination of turnip seeds generally occurs within 7 days. The ideal temperature range for the germination process is 45° to 85° F, but it can sprout at temperatures as low as 40° F. Consistent moisture is the key for good germination, healthy growth as well as a satisfactory yield. 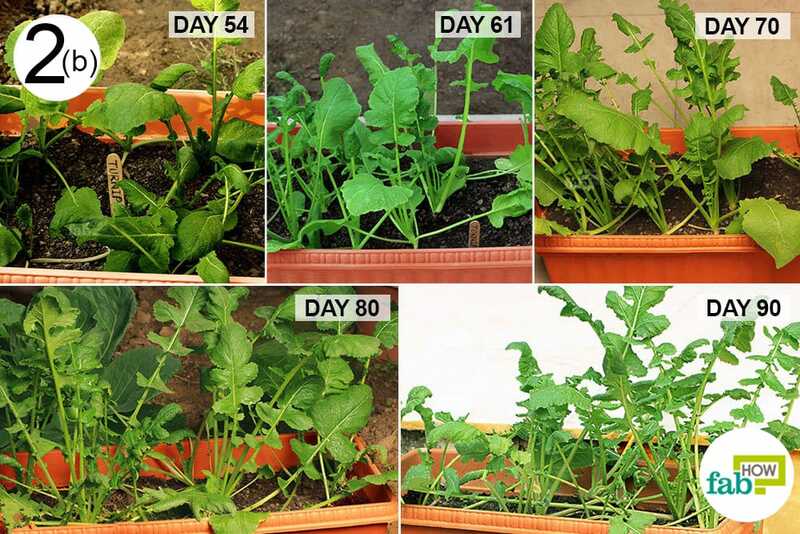 Thin (remove unwanted plants) turnip seedlings to 2 inches apart saving the most robust plants. When the plants reach approximately 4 inches tall, thin turnips to 4-6 inches apart and enjoy the greens from the pulled plants. Cleaning the outer leaves from turnips naturally disrupts the life cycles of various leaf spot diseases and insect pests. Keep your plant as clean as possible. Water your vegetables in the early morning to allow the foliage to dry out before the cooler evenings. This will aid in the prevention of mildew and lessen pest problems. If an aphid problem does develop, remove any badly infested leaves and apply an organic aphid control spray or homemade organic pesticides. You may harvest the delightful greens after the plants have grown 4 to 6 inches tall. However, do keep in mind that harvesting the greens delays the development of the roots. If you have planted timely, there’s no reason why you shouldn’t enjoy turnip roots as well as greens. Most turnip varieties are ready to harvest after 6 to 10 weeks. Check directions on your seed pack for complete instructions. Small, young turnips are nicer to eat and more tender. However, you can harvest turnips at any size. For fall turnips, consider waiting for a light frost (but not a hard freeze) before harvesting to produce a sweeter tasting vegetable. If the storage room is limited, turnips can be stored for up to 3 plus months in a cool outdoor place covered with clean straw. Some varieties grown specifically for greens may produce woody roots that can be quite unpalatable, while root-specific varieties may not offer edible greens. Be sure to evaluate your preferences and select the variety accordingly. Plant the turnips sparsely if growing for roots, as roots require room to develop. On the other hand, when grown exclusively for greens, they can be densely planted. If growing in a soil bed, rake and hoe the patch deep to loosen the soil. Soak the bed deeply beforehand to encourage speedy germination. 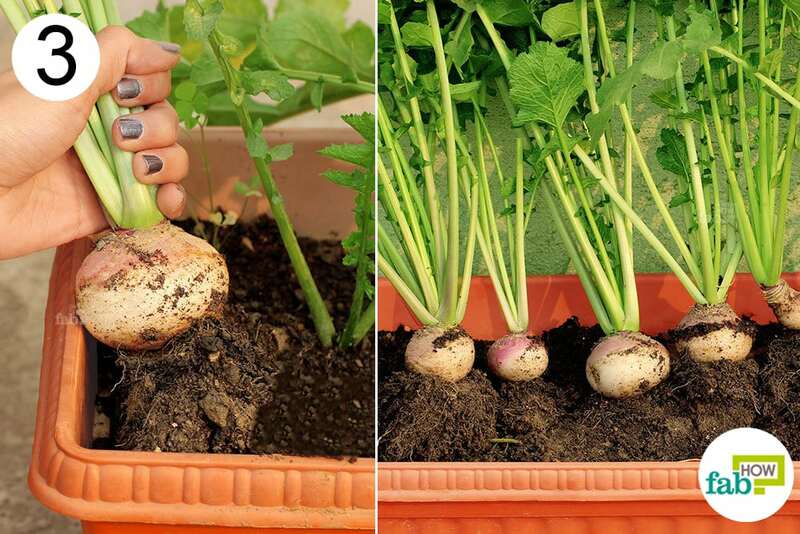 Plant turnips every 2 weeks to ensure a continuous harvest. Being a root vegetable, turnips go well with carrots and radishes when planting in the ground. To prolong the storage period during the winter, bury the roots in a container with dry soil to preserve moisture and freshness, and store it in your basement. Avoid high nitrogen fertilizer. It will deter root development in favor of the leaves. Shu, Xiang, Yang, et al. Cruciferous vegetable consumption is associated with a reduced risk of total and cardiovascular disease mortality. The American Journal of Clinical Nutrition. https://academic.oup.com/ajcn/article/94/1/240/4597862. Published May 18, 2011.